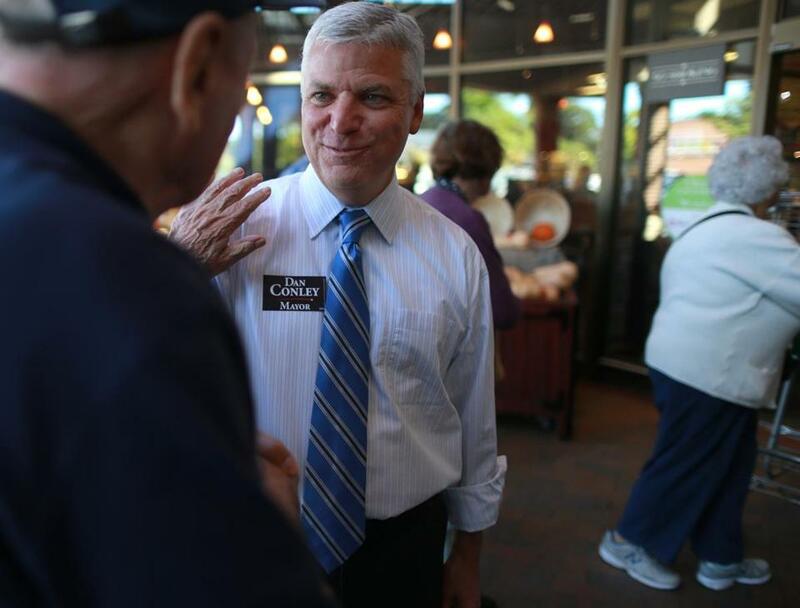 Bernard Steverman greeted mayoral candidate Daniel F. Conley during a visit to a Roche Brothers in West Roxbury. A new poll showed Conley was tied for second with Representative Martin Walsh in a close contest. Who knew transportation fanatics could pack a house? At a Tuesday night candidate’s forum at the Boston Public Library on transportation and livable streets, more than 450 people filled an auditorium — and more were turned away from the overflow room — to watch eight of the mayoral race’s 12 candidates spar on issues ranging from the Massachusetts Bay Transportation Authority, minimum parking requirements, Seaport District traffic, speed limits, bus lanes, the state’s transportation finance plan, and, of course, the oft-discussed separated bike facility known as the “cycle track,” perhaps the most popular topic of the night. A list of Thursday’s campaign events, as provided by their campaigns. Candidates Charlotte Golar Richie, Robert Consalvo, Daniel F. Conley, and David James Wyatt did not attend the forum, which was sponsored by more than two dozen local organizations dedicated to transportation and development issues. State Representative Martin J. Walsh promised to lower the speed limit on Boston streets, declaring that 30 miles per hour is too fast for a densely populated city. John Barros lambasted him — and, indirectly, Mayor Thomas M. Menino — for failing to pass a more extensive transportation finance package that could have provided more money for better MBTA service. Connolly and Councilor Michael P. Ross agreed on their willingness to lower minimum parking requirements in some neighborhoods, and most said they would consider instituting a modest fee for resident permit parking passes. Ross went on to declare that he would revive the Night Owl, the late-night bus service that operated for a few years in the early 2000s before it was shut down by T budget cuts. “I promise you, I will bring that back,” he said. Charles Clemons, a radio show host, said improving the community decision-making process for new developments and transportation infrastructure is one of his goals. Bill Walczak, cofounder of the Codman Square Health Center, criticized State House moves on transportation funding — “it’s a lousy bill,” he said — and said that as mayor he would eliminate food deserts, offer more green space, and keep out casinos. The Boston Teachers Union formally voted to recommend Councilors Rob Consalvo and Felix G. Arroyo for mayor Wednesday afternoon, in its first mayoral endorsement in more than two decades. The backing of the two candidates could provide them with a boost in a tight race in the crucial days before Tuesday’s preliminary election. Thousands of union members live in the city, and they could help Arroyo and Consalvo by getting the word out. The endorsements come with $5,000 for each candidate, Stutman said. Consalvo declined to accept the money last night. He has been pushing other candidates to sign a so-called People’s Pledge, an agreement designed to limit spending by outside political groups. “To avoid even the appearance of violating the People’s Pledge, we’ll decline the $5,000,” said Consalvo’s spokesman, Kevin Franck. Arroyo, however, will accept the $5,000 from the BTU, his campaign said Wednesday night. “As the proud son and husband of public school teachers, I am excited to have earned the support of the men and women who educate our children,” he said in a statement. Both Consalvo and Arroyo were present at the union hall in Dorchester and gave short speeches after the decision was announced. Supporters for candidates had a presence inside and outside, holding signs and handing out fliers. The two received applause and standing ovations as they spoke to the crowd in the hall. Arroyo thanked the crowd, saying he would work to improve the public schools, “but we will do it by working with you, not against you,” he said. Consalvo echoed the sentiment of appreciation. “I’m so humbled and honored to accept your endorsement for the mayor of the city of Boston, and I thank you so much,” he told the crowd. Consalvo praised the teachers and parents and said he would be there to listen to their needs as mayor. Earlier Wednesday, Consalvo received an endorsement from the Network for Public Education, a national advocacy organization set on preserving and strengthening public schools. A new poll shows Councilor at Large John R. Connolly with a slight lead over a crowded field in the Sept. 24 preliminary race for mayor. The poll by Suffolk University for the Boston Herald found Connolly with 16 percent of the vote. Suffolk District Attorney Daniel F. Conley and state Representative Martin J. Walsh tied for second in the poll with 12 percent. Boston Herald survey in July.